To be fair, though, banning the name had nothing to do with the singer; so far as I could tell (after the fact) that was entirely a matter of One Obnoxious Troll who was a Studer groupie. I didn't know that! Thanks for the background story on the banning of Studer at NYT OF. I thought the Studer fan was spamming! As to the Debussy, you mean I should restrain myself from mentioning Pelléas et Melisande? I love that opera! I claim Freedom of Speech! Why, Lis, I should never dream of infringing upon your freedom of speech. 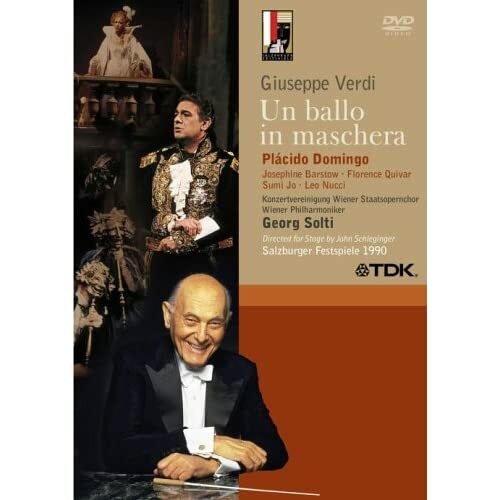 As promised I took some time after work today to watch this dvd recording on Un Ballo. This production sets the opera in the original setting of Sweden, Verdi's intent all along before the censorship officials got to him and forced him to set it in Colonial Boston. Solti takes over Karajan's role as conductor and opens this opera with style. The opening scene is as Verdi envisaged, it is the 1790s at the Court of King Gustav III of Sweden. Great attention was given to costumes, the lavishness of the Court, the mannerisms of the characters etc. I much prefer this setting than Colonial Boston. The VPO is as usual in top form, the music was crisp, focused and from the overture onwards you could tell Soti was in full control. Every scene that followed was true to Verdi's intention, the fortune teller's (Ulricha) dwelling was dark and ominous, the audience was treated to some stage voo-doo acting which seemed appropriate for the setting, the graveyard where Amelia was to retrieve the herbs (plants) to rid her of her love for King Gustav was as eery and dangerous as one could expect. The highlight of it all was when the stage turns right before the audience to usher in the the Masked Ball, that was really something to see: all the guests in their oppulent costumes disguised and dancing just before the assassination of the King made this production a feast for the eyes. Last but not least the singing: three singers stood out in my opinion (Domingo as King Gustav, sumi jo as Oscar and Leo Nucci as Renato) These three were really enjoyable to hear and watch especially Sumi jo (Oscar) at the masked ball and Domingo's death scene, Leo Nucci shined in practically every scene he was in. Two points to quibble about: I prefer a more docile Amelia (vocally and acting wise) than that portrayed by Josephine Barstow but thats just my opinion and I was a bit put off by the constant clapping after every other aria/ensemble.......must be a Viennese thing. Overall a very enjoyable performance, very entertaining and not to be missed. Karajan did what for him was standard procedure of producing a sound recording with the cast before first night of the production, a strange concept I feel. It means that there are Cd's of Karajan conducting the cast. The recording would then be used and the singers mimed while blocking in the final rehearsals. In Vienna the first night audience would receive copies of the Cd's as part of their ticket price. I think it was not just his final opera recording, but his final studio recording. Barstow was really past her best by this point. It had never been an ingratiating voice, but her acting was magnetic and Karajan had basically just discovered her for himself and was going to start to work some more with her. It was quite a blow to her career when he died. If you did want a CD set as well at some time, as you enjoy Solti, then his set is I feel very successful with Pavarotti 'in' his part, rather then merely singing and Margaret Price, completely superb as Amelia. Mike I do have Solti's audio cd recording with Pavarotti and Margaret Price and I love it which is why I jumped at the chance to buy this dvd recording. You will have to excuse my ignorance here but I am a little baffled by what you have written about the singers "miming while blocking" in this live performance that I just saw. Forgive me for asking but are you telling me that all the cast members were not actually singing but merely moving their lips to an already existing recording? I am a little baffled by what you have written about the singers "miming while blocking" in this live performance that I just saw. Forgive me for asking but are you telling me that all the cast members were not actually singing but merely moving their lips to an already existing recording? No. As Mike's post mentioned, this was done in the final rehearsals. This was apparently done to preserve the singers' voices for the actual performances. As mentioned, this was Karajan's standard proceedure. Yep Marvin....as Wendell explained. I think it an odd idea to the extent that during, or at the end of the run that whole production will have more depth. I believe that later recordings would have enabled the singers to get more inside their parts and interact possibly more excitingly. But Karajan had his methods, I can see the logic of it all, for instance; it allowed lots of rehearsal without the orchestra, or perhaps even Karajan being present; so the cast could get to grips with the production. I do wonder then how inflexable the subsequent performances might have been, or was there nevertheless room to experiment in the moment of the drama. Also, since Karajan was often (but not in this Ballo) the stage director of these productions, he wouldn't have to stage-direct from the pit, or have an assistant to conduct while he was working on-stage. Thank you Wendell and Mike for further clarifying this to me. Yes it is a strange procedure to restrain the singers in this way in the final rehearsals. I would imagine it would be difficult to determine what overall "effect" - degree of flexibilty this procedure would have on subsequent performances. On the plus side I would imagine as Wendell pointed out that the singers would be more "fresh" but on the minus side I would imagine as Mike pointed out that it would have restricted the development of the familiarity (which seems quite likely) of the singers with the parts they are playing as well as the interaction between them. Subtract the minus effect from the performance and add the plus and this is what you get........apparently Karajan did not completely believe in the motto PRACTICE MAKES PERFECT. Still I like the idea of passing out a previously recorded cd audio recording of the opera featuring the cast after the performance as part of the ticket price especially when it is a performance as enjoyable as this one. I am looking for a really good recording of PARSIFAL (Wagner) on DVD to supplement my cd audio recording. I have never seen this opera staged so this will be a first for me. Parsifal's music is so sublime it would be a shame not to see it staged. Which DVD recording do you recommend? Thought nobody would ever ask! My favourite choice is the Opus Arte DVD of the Nikolaus Lehnhoff production, Kent Nagano conducting the Deutsche Symphonie-Orchester. The cast is one of the best ever with Matti Salminen taking charge as Gurnemanz. Too often this character is boring, not with Salminen! Of course Waltraud Meier is again the best Kundry we have at present, and the best we had in a long time. Thomas Hampson surprises is an active Amfortas under Lehnhoff's direction, on his feet, instead of, as usual, on his back in bed; very dramatic. 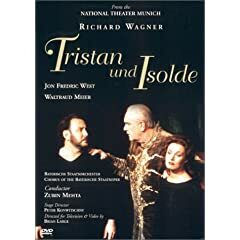 I am mentioning Christopher Ventris in the title role last, because he might not be the most powerful Wagnerian tenor, but he still fits in well with this powerhouse. You'll be fascinated by this production! This DVD has very good vocal performances, but the staging is ridiculous (updated Eurotrash). From Munich where the opera had its premier. WOW I was not aware of this production, thanks for the recommendation uffeviking . For years I did not buy opera DVDs. I feared the price, low quality etc. I also didn't consider myself a big opera fan. Little over a year ago I saw Rameau's Les Boréades (Christie) on TV. I was blown away by the increadible choreography (and music of course as a Rameau fan). I was glad to find out the performance was released on DVD by Opus Arte. I bought the set. At that time someone in the old GMG gave a hint about £5 Puccini Turandot (Paternostro) at Play.com. I bought it and liked it a lot. Recently I found Puccini's Tosca (Muti) at the local Lidl store for just 4 euros! I also recently bought Rameau's Les Indes galantes (Christie). I have never been to an opera in my life. These 4 opera DVDs are my only "real" opera experiences. I have operas on CD but I have listened them as pure music without any interest of the plot. DVD's make me interest of the plot. I am surprised about how simple, weird and slow the opera plots are. Anyway, the plot, choreography, set pieces and the music create together great entertainment. I am getting hooked. It seems buying opera on CD is irrational when you can have DVDs. There's picture (anamorphic 16:9 on new productions), 5.1 channel sound and extra material. Opera DVDs may seem very expensive but they mean a lot of audiovisual entertainment. As my budget is very limited, I have to almost stop buying CDs and concentrate on opera DVDs. The next DVD I am planning to buy is Handel's Giulio Cesare (Christie). Glad to hear that you are acquiring an interest in opera 71dB. I, like you have operas on cds (well over 50 I am a huge fan) although none are from the Baroque period. I have enjoyed them greatly for the music only . Only recently have I started to acquire them on DVD and the experience is MUCH MORE satisfying. I found that I was missing alot by just listening to them. Operas should be staged (seen) and not just heard. True, as you have said, some opera plots are downright boring but some operas really need to be seen such as Wagner's Ring cycle, Strauss Elektra and Salome (for the shock factor-I do not want to give anything away) and of course lets not forget about Verdi's Aida (for the staging and constumes) and Otello (this one is a real treasure trove of Verdi's music and Shakespeare's drama). Opera and drama go hand in hand or so Wagner says. Glad to hear that you are acquiring an interest in opera 71dB. I, like you have operas on cds (well over 50 I am a huge fan) although none are from the Baroque period. I have enjoyed them greatly for the music only . Only recently have I started to acquire them on DVD and the experience is MUCH MORE satisfying. I found that I was missing alot by just listening to them. Operas should be staged (seen) and not just heard. Listening to operas on CD is like listening to movie soundtracks. Enjoyable but something is missing. DVD means a new way to enjoy opera at home. DVD is an excellent format for opera. True, as you have said, some opera plots are downright boring but some operas really need to be seen such as Wagner's Ring cycle, Strauss Elektra and Salome (for the shock factor-I do not want to give anything away) and of course lets not forget about Verdi's Aida (for the staging and constumes) and Otello (this one is a real treasure trove of Verdi's music and Shakespeare's drama). Opera and drama go hand in hand or so Wagner says. I didn't say the plots are boring. In fact they are interesting but they are also simple and slow compared to movies were you can tell stories at much faster speed. Verdi is not my type of music. Rameau, Handel and Puccini are my favorites. Wagner is ok too. Yes, it's true opera on CD can be even more expensive! Ironic, since CDs omit the visuality. Sorry I misunderstood you. Personally I find some opera plots rather dull but if the music is great then thats good enough for me . I am not familiar with Rameau's operas (nor Handel's for that matter) would Les Boréades be the best one to start with? Would you recommend that Opus Arte DVD recording for a first timer? Yes, Les Boréades on Opus Arte is a very good start because the choreoraphy/production is stunning. Rameau's music is always wonderful.